Remember how important ad blocker extensions were a few years ago? You couldn’t browse the web in peace without intrusive, annoying advertisements popping up on your screen and slowing your pages down. By 2016, it’s calculated that 30% of online devices were using ad blocking software, including more than 300 million mobile devices. Their necessity was truly a testament to how bad the ad experience used to be, and you could say online ads were about as favorable with consumers as telemarketers. What is the Coalition for Better Ads? 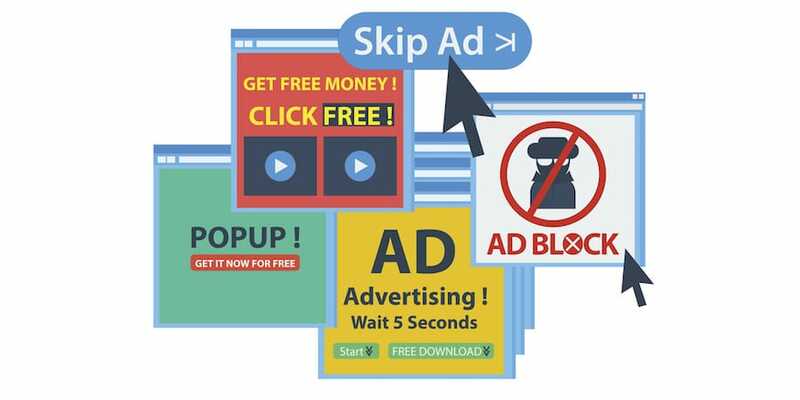 Nowadays, ad blocking programs are still widely used, still block a lot of ads, and even come standard on certain web browsers, but have you also noticed that the ads you do see have gotten much better over the past few years? That’s no coincidence. In 2016, 16 companies and trade groups including Google, Facebook, Microsoft, Procter & Gamble, Unilever, the American Association of Advertising Agencies (4As), the Interactive Advertising Bureau (IAB), and IAB Europe, formed the Coalition for Better Ads. Their goal: to set standards for ads that are more acceptable for internet users, and provide a better user experience when anyone sees or interacts with a digital ad. Since forming the coalition, these organizations have done extensive research studying how internet users interact with ads online, and have offered their suggestions on how to best improve the user experience. As you can imagine with so many big names involved, they’ve been able to compile a lot of powerful data, and they offer it all for free right here on their website. That said, being a helpful resource and making the data available to advertisers is only half of the equation to creating a better ad experience online. 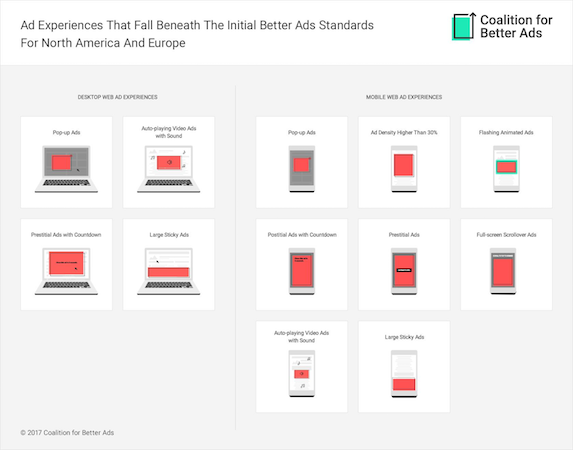 This month, the Coalition will start rolling out their Better Ads Experience Program, a voluntary program for organizations that promises to improve the online ad experience and promote a market-wide adoption of the Better Ad Standards. It will be based on this framework created by the organization, and will certify web publishers that agree not use disruptive ad practices, along with accrediting browsers and ad tech companies that help assess publishers’ compliance with the Standards as well as filter ads based on the Standards. Google has already announced their participation in the program, and will be rolling out a an update to their Chrome browser in February that automatically block the ads that are deemed too aggressive by the coalition. The goal of the Better Ads Standards is to create a more user-friendly experience which should lead to more users clicking on the ads and creating more value to the advertisers. That being said, there will be continuous changes and learnings from the research the Coalition is gathering, which means in a few years these standards could very well change again. If you want to stay ahead of the curve, it’s up to your agency or marketing department to be knowledgeable about the new changes, and how you can make the necessary adjustments to ensure your website is in line with the Better Ads Standards. The Coalition’s website is a great resource for learning more about the different ad types that are most disruptive, and offers data that can help you optimize your advertisements for effectiveness. By creating better ad experiences for online users, we can all help solve the problem of ads being ignored online.